If you are new to fermenting, Nourishing Traditions cookbook, or the the Weston A. 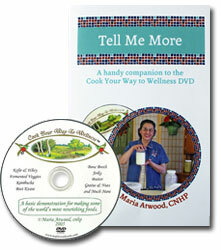 Price Foundation™, then this detailed 90 minute DVD and Tell Me More Booklet is for you. - Sally Fallon, coauthor of Nourishing Traditions. "I really enjoyed Maria's DVD. It's simple, disarming, and concise. It will be a great addition to my work and lifestyle." "Loved your DVD! It is refreshing to see these topics covered in such a straightforward manner. You make it easy to understand, simple to do. I also like have a DVD that is make in chapters so I can easily find the topic. Your cheerful presentation makes the whole DVD charming. I especially enjoyed the section on jerky, with tales of your Piute Indian Grandmother. Before I saw your demonstration I did not have the courage to attempt this!" Two great ways to purchase! * NOTE: Selene River Press is a USA based publisher and distributor of holistic nutrition and educational materials for both the public and practitioners. Feel free to visit their website, and order from this link.